A total of 19 charter flights evacuated Chinese citizens from Libya via Malta. Here a chartered China Eastern Airlines Airbus A340 is seen at Malta International Airport on 26 February 2011. 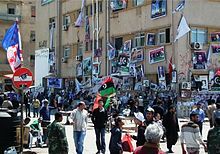 This page is based on the Wikipedia article Libyan Civil War (2011); it is used under the Creative Commons Attribution-ShareAlike 3.0 Unported License (CC-BY-SA). You may redistribute it, verbatim or modified, providing that you comply with the terms of the CC-BY-SA.